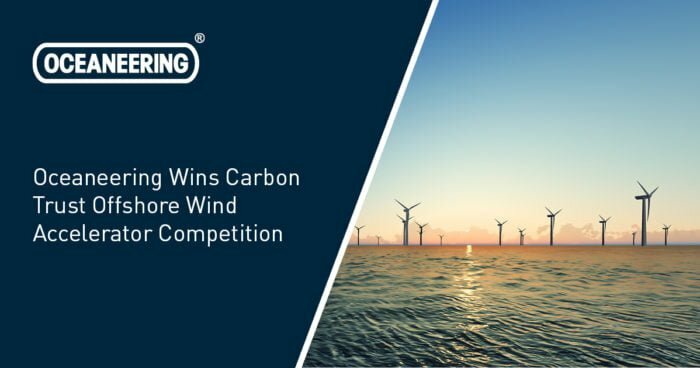 February 1, 2018 — Houston, Texas — Oceaneering International, Inc. (“Oceaneering”) announced today that one of its wholly owned subsidiaries, Oceaneering International Services Limited, was named a winner in the Carbon Trust Offshore Wind Accelerator (“OWA”) competition. The purpose of the competition is to seek new or adaptable techniques that provide innovative and low-risk inspection solutions that address industry challenges. Oceaneering was selected as a winner for its techniques to address the inspection of welds on monopiles and jacket foundations.The company will receive tailored support from the Carbon Trust and OWA partners, including the potential to test the techniques at operational offshore wind farms. To learn more about The Carbon Trust and the Accelerator program, visit https://www.carbontrust.com/news/2018/01/winners-of-subsea-inspection-competition/. Articles To solve the unsolvable, Oceaneering seeks out the utmost experts in their respective fields. We provide engineered services and products primarily to the offshore energy industry. Today, we also use applied technology expertise to serve the defense, entertainment, material handling, aerospace, science, and renewable energy industries. With a varied and diverse pool of expertise, Oceaneering strives to be the go-to thoughtleader in our wide-ranging on- and offshore service lines. We thrive by creating industry-changing technically creative solutions for the most complex operational challenges under water, on land, and in space. Our experts are sought out for their knowledge and experience, to shed light on the latest innovative technology and trends within the wide-ranging industries we serve. Our experts are able to speak to these subjects because they are out in the field, working shoulder-to-shoulder with our clients and associated contractors. They work closely to devise solutions to problems that couldn’t be solved otherwise. We demonstrate our value every day, striving to complete projects on-time and on-budget. Our experts have penned thousands of words on topics related to remotely operated vehicles, subsea hardware, asset integrity, flow assurance, diving, survey and mapping, vessels, well intervention, workover control systems, pipeline repair, inspection, non-destructive testing, decommissioning, renewables, umbilicals, valves, marine services, product testing and qualification, data management, vessel navigation and positioning systems, science and other research, and space systems. Our articles section shines a spotlight on our best and brightest thoughtleaders offering history, data, case studies, and even opinions on industry trends and service techniques, so that we may open a dialogue with the rest of the industry, in order to see how we can all better ourselves and come up with the latest solutions and processes yet to be created. We partner with industry publications and other newsmakers to help tell our story and those of our clients because we aim to not only solve the unsolvable but demonstrate our value and expertise as a company, every single day. We do this work with much importance placed on safety, because safety is instilled in every worker, in every region in which we do business.